This is the final chapter of "Love Songs". I hope it's a satisfying end; in addition to the events that are obvious from the description, there's also the clearing up of a small mystery concerning Liz that's been lingering every since her "present day" debut in "Chronicles of Gozer". Very sweet, but I want to slap Egon... Ugh. I guess this is after Janine's breakup but before herbdrinking.? 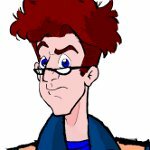 Well, at this point in time Egon's probably more than ready to slap himself. He's been eaten up by a lot of guilt over the previous five years (as of 1996) but ultimately, as we see in EGB and GBOT stories set afterward (ie "Dreams Reborn", "Hearts In Eclipse", and especially "Forever") this version of Egon comes out the better for it. I mentioned Janine having a hangover in "Believe", and she was even a bit tipsy during Venkman's wedding ("For Worse Or For Better") so it probably started earlier. (C'mon, she realized she was married to Louis Tully. It's amazing she didn't become an alcoholic ) Actually, by this point she may have stopped--her head's clearer than it's been in a long time, and as we see over the year and a half or so between her scene in "Blessed" and the GBOT story "Clinically Insane" (and of course the EGB opener "Darkness At Noon") she will dig herself out of that hole, and like Egon end up all the better for it in the end. This is Ray and Liz's story, first and foremost, but I wanted to get a little bit of everybody in it. And this is sadly where GBOT Egon and Janine were in 1994-1996. Great story Fritz! What about a story about the birth of Charlene Zeddemore? Not in my plans at the moment, but I won't rule it out if inspiration strikes. I hope that you do write the story about Charlene's birth or maybe I can do it. What do you think?